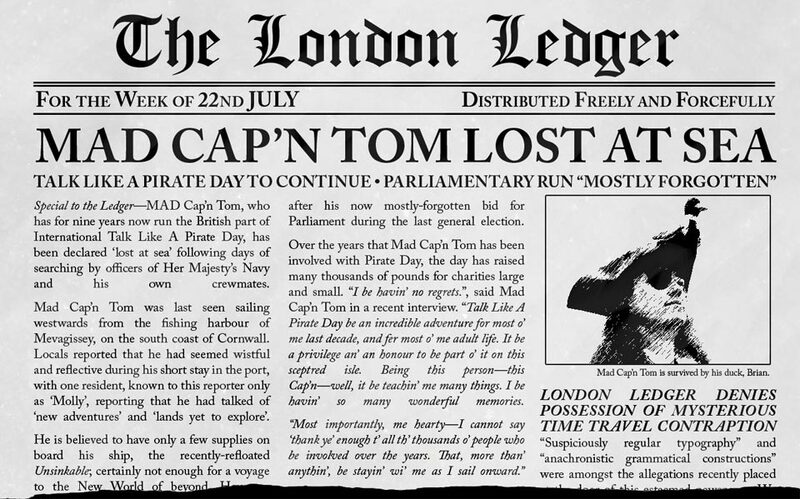 Special to the Ledger—MAD Cap’n Tom, who has for nine years now run the British part of International Talk Like A Pirate Day, has been declared ‘lost at sea’ following days of searching by officers of Her Majesty’s Navy and his own crewmates. Mad Cap’n Tom was last seen sailing westwards from the fishing harbour of Mevagissey, on the south coast of Cornwall. Locals reported that he had seemed wistful and reflective during his short stay in the port, with one resident, known to this reporter only as ‘Molly’, reporting that he had talked of ‘new adventures’ and ‘lands yet to explore’. He is believed to have only a few supplies on board his ship, the recently-refloated Unsinkable; certainly not enough for a voyage to the New World of beyond. ...after his now mostly-forgotten bid for Parliament during the last general election. Over the years that Mad Cap’n Tom has been involved with Pirate Day, the day has raised many thousands of pounds for charities large and small. “I be havin’ no regrets.”, said Mad Cap’n Tom in a recent interview. “Talk Like A Pirate Day be an incredible adventure for most o’ me last decade, and fer most o’ me adult life. It be a privilege an’ an honour to be part o’ it on this sceptred isle. Being this person—this Cap’n—well, it be teachin’ me many things. I be havin’ so many wonderful memories. Mad Cap’n Tom is survived by his duck, Brian.